Hi Ö-zil to the Arsenal! Im still on fm 18. I would like to see your update and the way you play in 433. 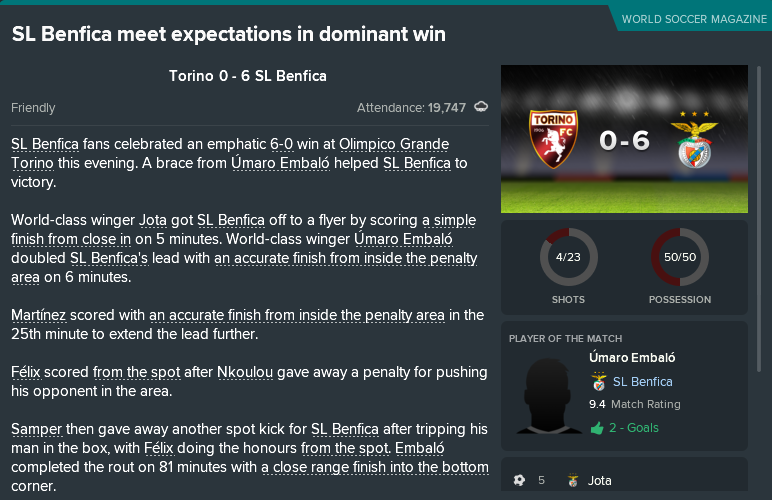 The Benfica academy is alive and kicking. I don't want to publicly spoil things so if you want some detail on individual player PA and wotnot, let me know and I'll PM you. 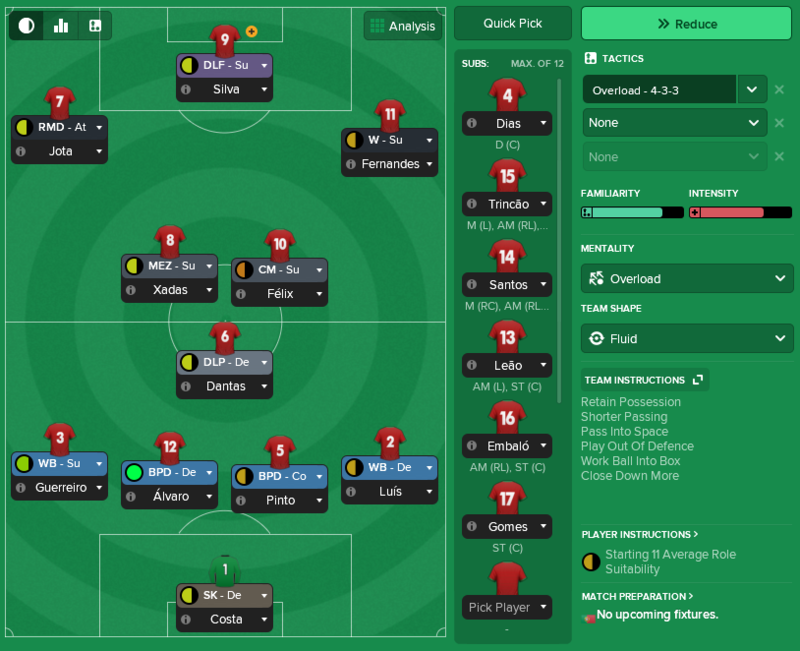 out of this topic, but I used your Arsenal Invincibles with Ajax in Fm2019 with great success so far. 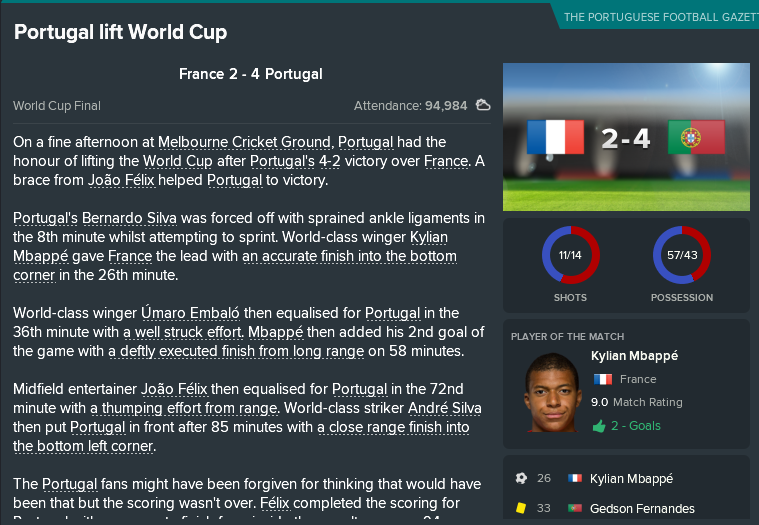 Hope you have time to play Fm2019 this year and produce some great threads again. Overload is still there. It's just called "Very Attacking". The new spectrum (ignore the red highlight that's from the existing tactic I'm using) - with Very Attacking's description. It's overload. Seems like they just renamed - Very Defense = Contain, Cautious = Counter, Positive = Control, etc. There may be some tweaks, but I think it's basically just renaming so people understand what they mean more intuitively. Oh and yes, would love to see some very enjoyable 433's from you, of course! Saw this thread today for first time. 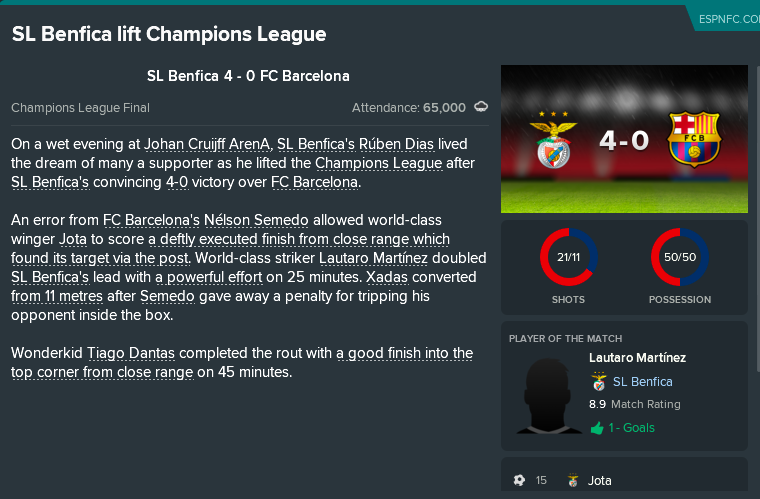 A little off topic, but the save I enjoyed the most was Benfica on FM 17, when I won the championship league with 10 academy players on starting eleven. Unfortunately, I couldn't do the same on FM 18, I had the team again with academy players, but never had sucess or was even close on FM 18. I will try again this year! 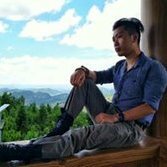 And I'm late, but great read on this thread! 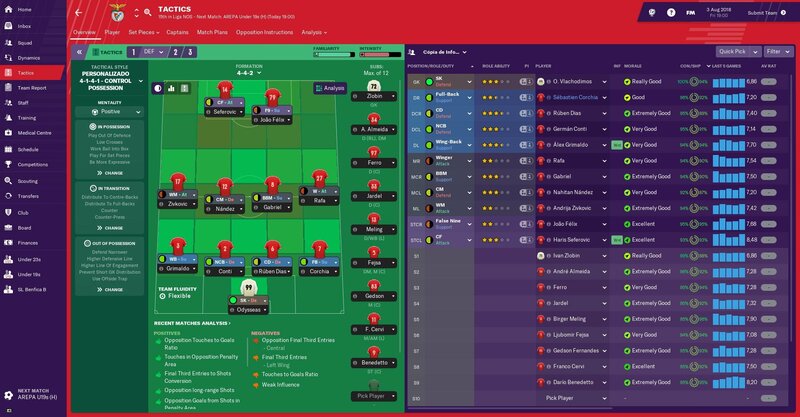 I'm still on FM18 and would definitely be interested in the tactics you're currently using! have to say, Diego Batista is just insane. Xavi and Iniesta in one player. Ah, yes. A few have mentioned Batista. He's not quite reached those heights on my save but I am expecting him to become a solid club player, when he can find some consistency. For those still following along so far, thank you for your patience. 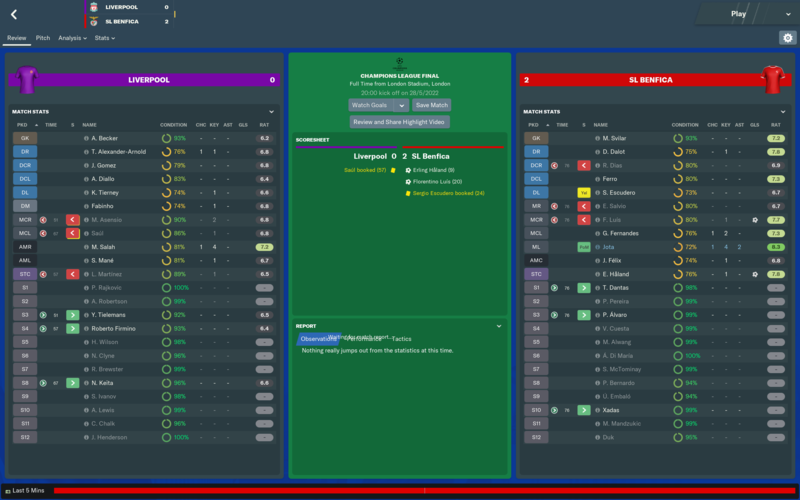 Work, life, travel and study has put Football Manager to a back seat for the past few months but this game has been ticking along slowly in the background whenever time has allowed but I've been nowhere near able to maintain regular updates. This game has been one of the most enjoyable, to date. 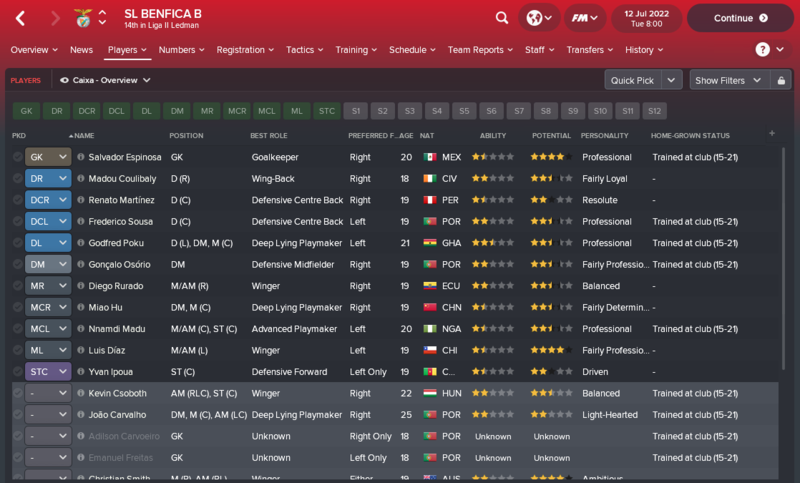 I would highly recommend Benfica to anyone looking for a talented young squad of players to bring through. 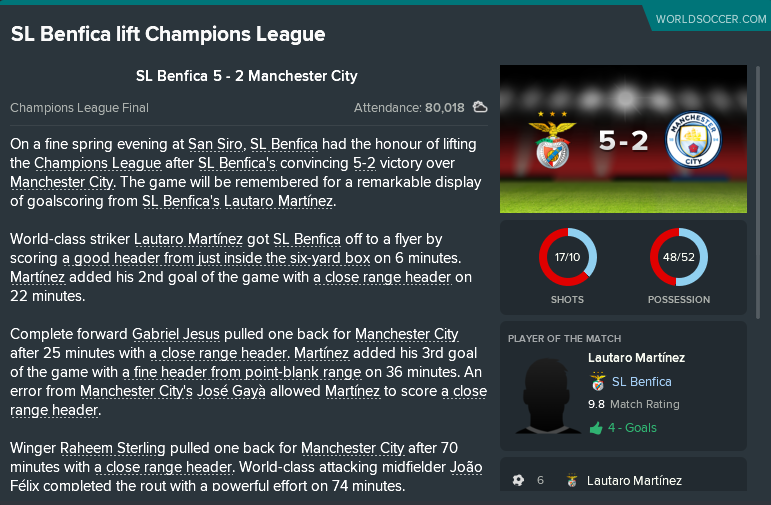 Last time out, we won the league and had a respectable Champions League campaign reaching the knock-out phase, playing a 4-4-2 diamond with a dominant midfield. Talented players from the academy were introduced with increasing regularity over the course of the season. Despite a great season, Talisca started forcing a move within weeks of returning to the club. The most daunting decision being to cash in on midfield colossus Ljubomir Fejsa to make way for 5'6", 18-year old playmaker Tiago Dantas from the academy. Cervi and Krovinovic also sent out on paid loans to Sevilla and Manchester City respectively in the hope of appreciating value as they develop. Fabregas joins to tutor and re-enforce the new style of play, alongside a couple of youngsters to keep the conveyor belt running. We adopted the 4-1-4-1 that has been employed by the Academy and B Team for the past 2-years, giving some sense of familiarity with the system. The biggest change is probably the shift from a physically dominant team, to a preference for intelligent technical players. The squad developed exceptionally as a group over the course of the season. Training remaining unchanged from the Tactical training from the last 2 years. Dominance of Portuguese domestic competition became yet more comprehensive. Cementing our status as the most exciting young squad in Europe, dominating an ageing Barcelona team to win the Champions League. 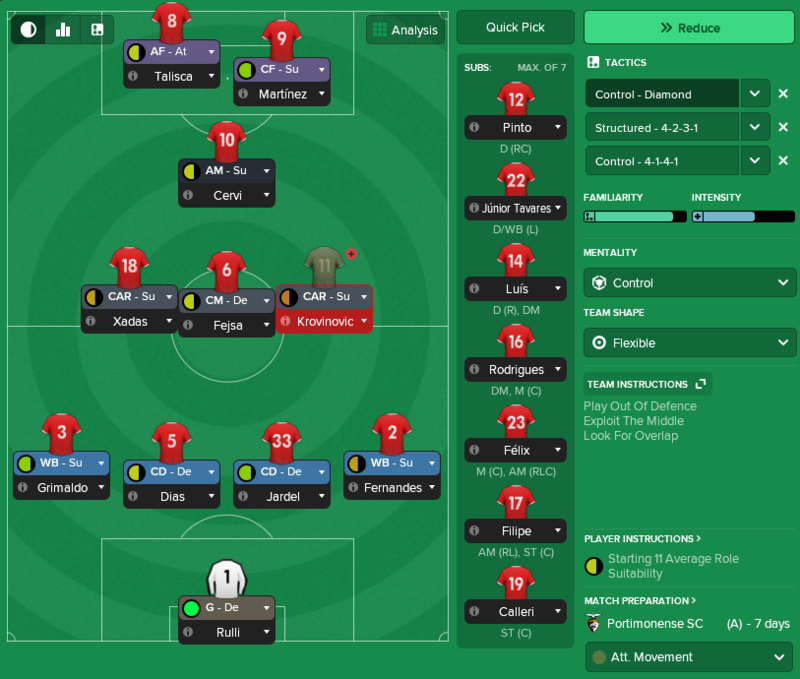 For the sake of actually getting this update out, rather than delaying until I have more time, I am not going to go into the typical in-game analysis of the 4-1-4-1 as it's the same as has been done before, but with more developed players. Excellent possession play, triangles everywhere and naturally dominates games. Regularly excellent attacking play in the 2-3-5 shape, however occasionally shut down by more physical midfield blocks. Jota (João Felipe) has developed into an electric attacking player with excellent dribbling, flair, agility and acceleration. The introduction of Florentino Luis massively improves the balance of the team with his intelligence, work rate and physicality. Covers right back, holding midfield and central midfield. The save took an interesting turn when Portugal crashed out of Euro 2020 early, presenting an opportunity to take this project to an international stage. The first challenge was the Olympic Games in Japan. 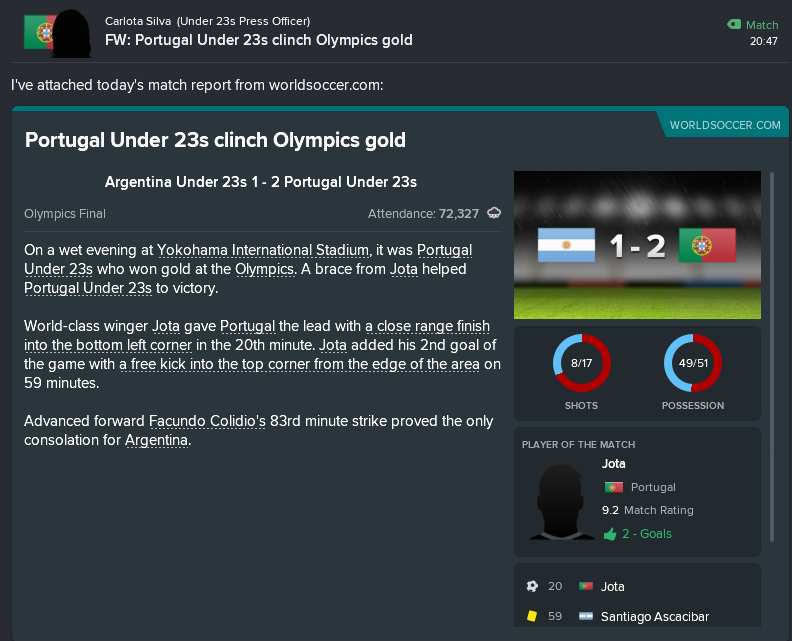 The Portugal U-23 squad was absolutely head and shoulders ahead of the opposition, so I decided to open the floodgates with a high-octane 4-3-3. The objective was to play high-intensity pressing, with quick, short passing and build up play through a technical midfield. 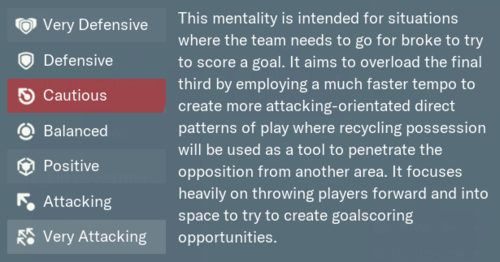 Overload gives us high mentalities across the team, high closing down, high line and high tempo. Team Instructions give us the shorter passing and build up play. Shifting to a 4-3-3 gives Jota more attacking freedom to cut inside with Guerreiro overlapping on the left. Gedson Fernandes playing in the front 3 adds physicality and work-rate to our pressing and facilitates Florentino Luis to come in at right back. Results were exceptional and some of the play was excellent. The squad is now certainly evolution, rather than revolution. 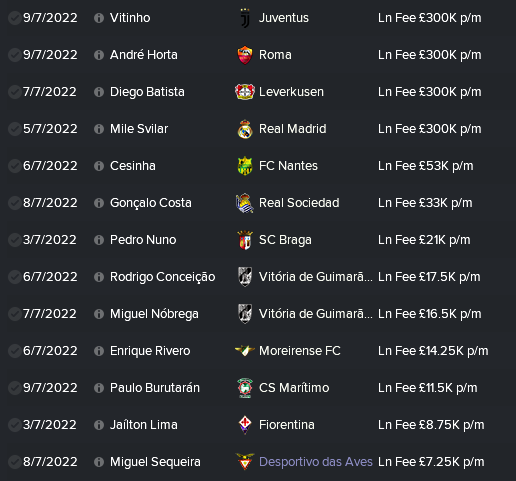 Keeping talented players at the club became the priority. After enjoying the style of play experimented with during the Olympics, I decided to translate that back to club level. Continued game time at the appropriate level is continuing to drive players development, maintaining the tactical training emphasising mental attributes. 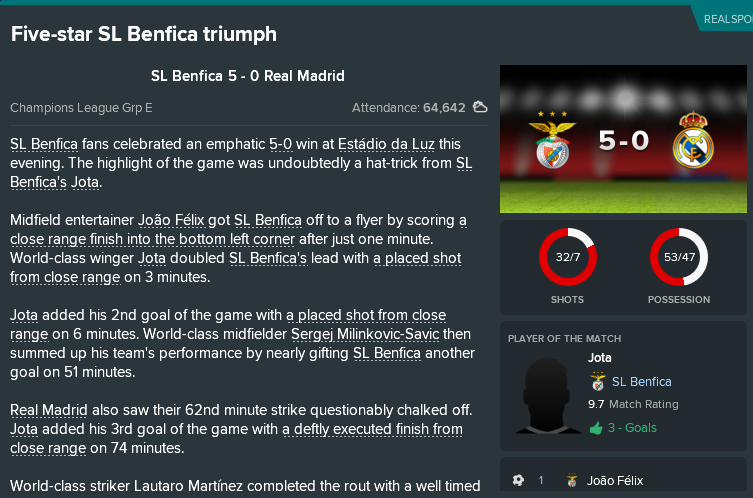 The presence of Gedson Fernandes in the front 3 and Florentino Luis at the back solidified the setup greatly, resulting in our strongest league campaign yet. Managing to break a goalscoring record which stood since 1947. However unfortunately falling at the last hurdle to a Real Madrid side we could really have beaten, but our lightweight midfield was exposed. Delighted with the way the team is playing, our squad and tactics are now certainly evolution rather than revolution. Essentially rotating the right flank of the team clockwise put the defensive and physical influence of Florentino Luis into a central position. Gedson Fernandes reverts to his more familiar role of wingback, and João Felix takes a creative inside forward role on the right of the attacking trident. Tiago Dantas remains the playmaker, but with the solidarity of Luis behind. Development continued, with the majority of the squad now playing at an extremely high level in comparison to the league. ..and the return of the Champions League. Entering the World Cup on the crest of a massive wave, we kept the system the core of the team uses week in, week out. Interestingly, there's quite a contrast between the relative ability when players are rated domestically in Portugal vs internationally at a World Cup. At this moment, I'm not sure. 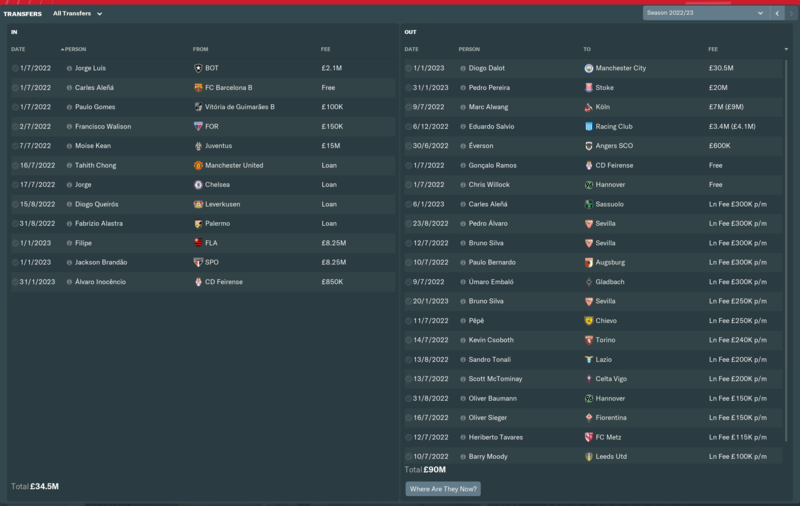 I've started keeping an eye on managerial movements in the major leagues around Europe as I quite fancy a new challenge, potentially taking a couple of players with me into a new league. At the moment, nothing fits so I'll be sticking with Benfica. 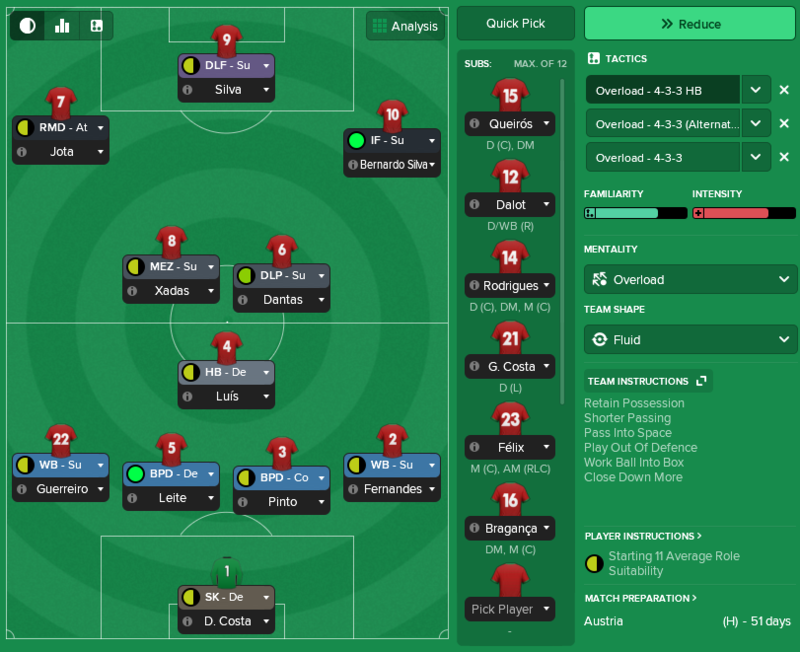 Experimenting in the pre-season with a 3-4-3 but undecided if it's going to work in the Champions League. Embalo has had a couple of fantastic seasons pushing into the first team and is now ready to start and his pace and power will add to the attack. That'll cause a re-shuffle with at one big name needing to leave the club. I'm not sure who yet, but it'll be a similar evolution next season. If there's interest, I can do a couple of match analysis when I have time. 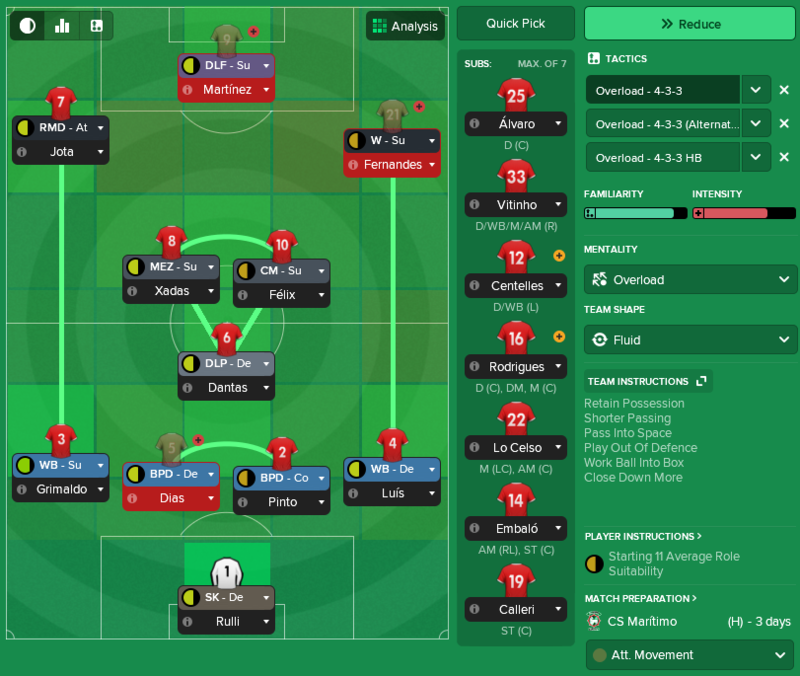 It's quite a basic 4-3-3 but played with overload and a group of players who have been working towards this style for a number of years. 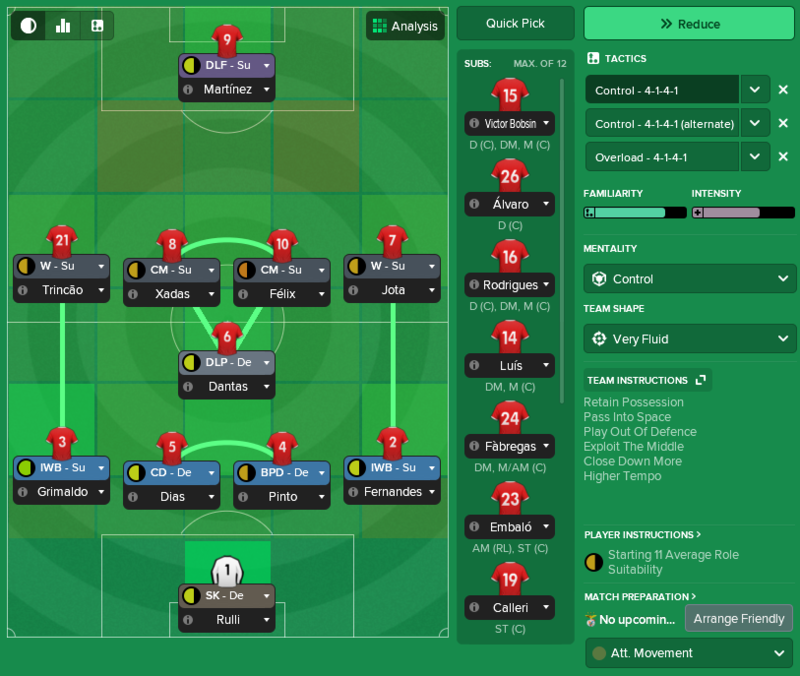 I'm really interested to hear if anyone's tried Benfica in FM2019, and whether this set of overload 4-3-3s works in other people's team or whether it's just the level of dominance Benfica have reached. Edited March 16 by Ö-zil to the Arsenal! Hey @Ö-zil to the Arsenal! I must say your threads are very inspirational. I've long been waiting for this update, so thanks for that. 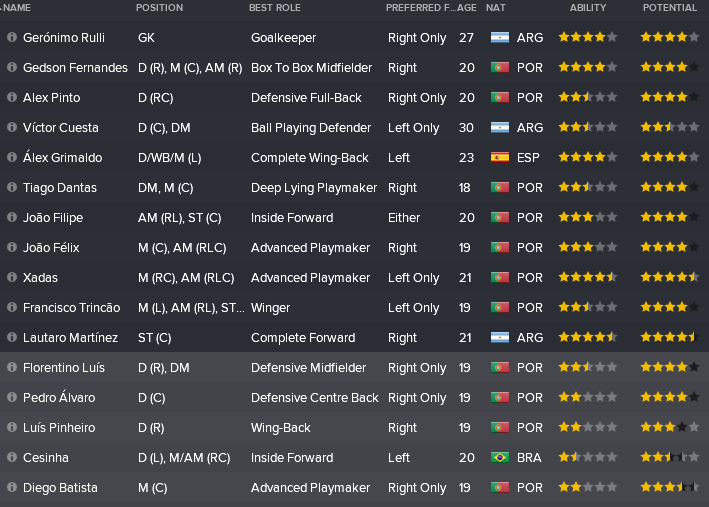 Some players (Trincão and Xadas) were bought a few years later so the AI hasn't developed them as much, but they're still good enough to play a part. 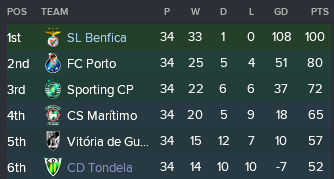 Being Portuguese and a massive Benfica fan, I tend to manage them in FM and this year is no different. In terms of Youth development, I didn't put the same emphasis as you did, therefore some players didn't develop as much but I'm still having fun. 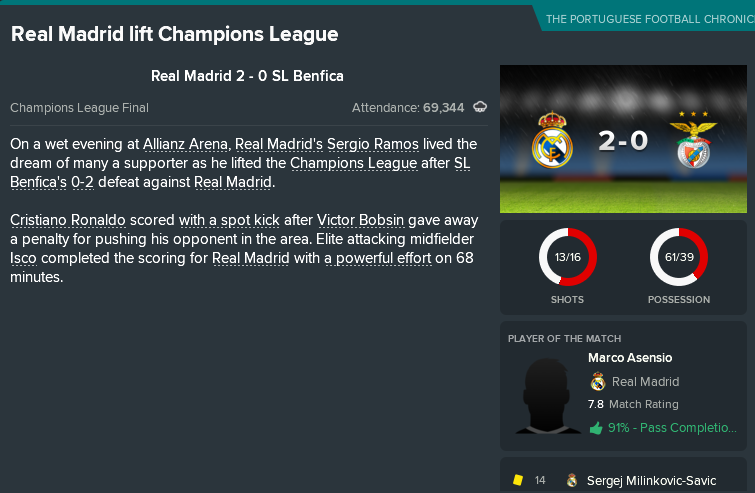 My biggest achievement has to be the CL win against Liverpool, where 7 from the XI (plus a few others on the bench) came from the academy. Style and Shape are very similar to yours (hence why the first line of this post ), but not as aggressive as overload. I've got a few tweaks lined up since our shot conversion isn't great, but we're doing well. A great read as always! @Ö-zil to the Arsenal! 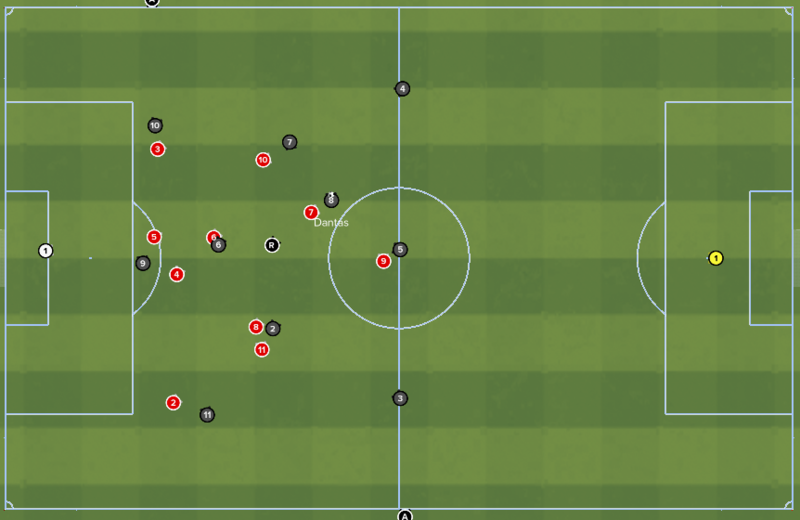 what do your other tactics look like alongside the 4-1-4-1 (i.e. alternate and overload)? are they they same but with different mentalities? Do you tend to give player instructions based around who is playing in your starting 11 or are they fixed for all players? I'm thinking of giving this kind of save a go with arsenal and establishing players like Reiss Nelson, Guendouzi, Maitland-Niles, Nketiah etc. as first team players. In a nutshell.. rubbish. Intakes each year have been consistently weak, which just goes to show the random element of newgens and why I preferred avoid the subject for the purpose of this thread. 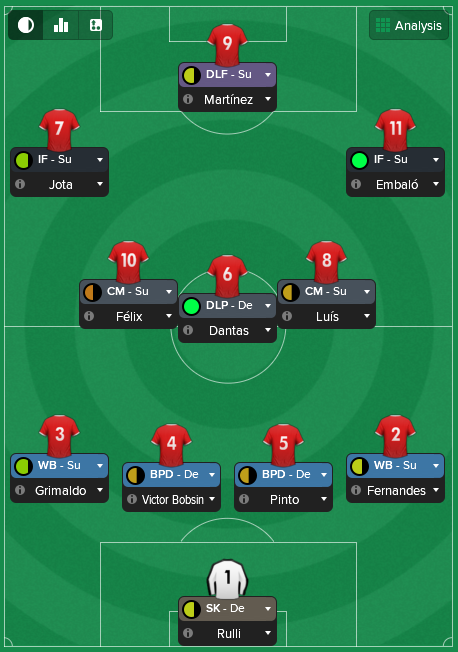 Not one Benfica-generated player is anywhere near the First Team squad, entering our 6th season and the current B Team is a mixture of players from all over the world. The first to make the squad is Lucas Aragon, signed from Argentina a few years ago and just off the back of a successful loan spell at Atletico Madrid. He's yet to set the world alight but looks like an exciting player. One thing I did want to mention was 3 players in particular who have been real 'club players' but have been the absolute embodiment of our approach as intelligent, technical footballers. They're no superstars like Jota, Dantas, Xadas or Martinez but they're so vital to the club. Happy to play a rotation role and impeccable in the role when called upon. All 3 come from the academy and have made more than 100 first team appearances with absolutely no fuss. Oliveira has so far proven to be a natural goalscorer at any level he's been tested at. Edited March 22 by Ö-zil to the Arsenal! A couple of youngsters already have driven personalities.Developing these kids will be fun. Hi @Ö-zil to the Arsenal! do you leave your 17/18 year olds in the U19 squad and move them in to the 1st team squad(if you are going to play them) on match day and then move them back into the U19 squad?Or do they stay in the 1st team squad permanently if you feel you're going to use them on a regular basis? @Ö-zil to the Arsenal! 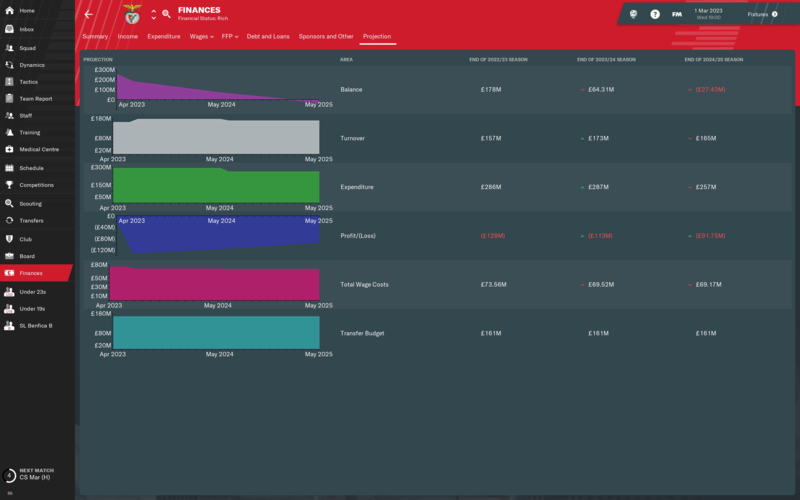 since you've kept most of your top players, how are your finances looking like? You did mention you kept the conveyor belt running, so I take it you earn money mostly through loans? How is the PT league ranked? Do you get more through TV deals? 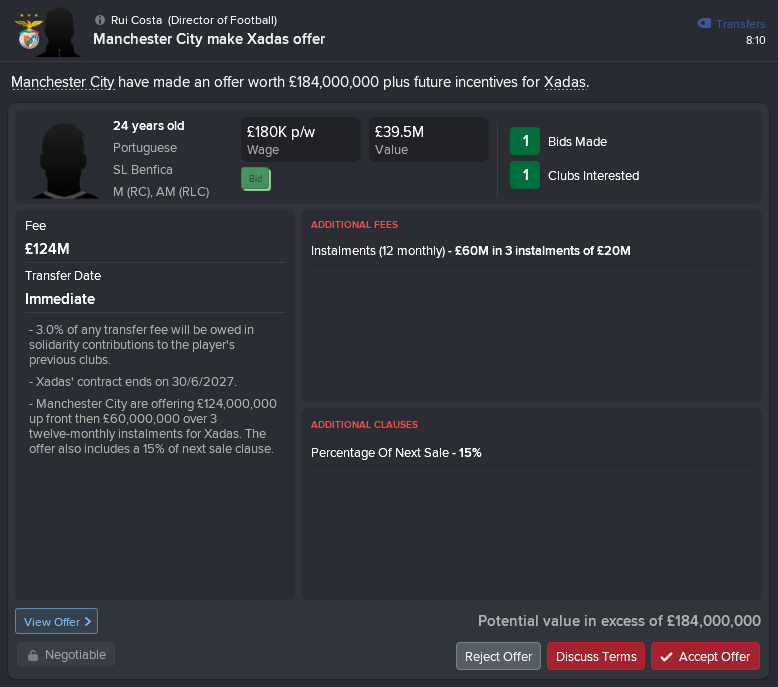 I'm in 2023 and still struggling to make any profit! 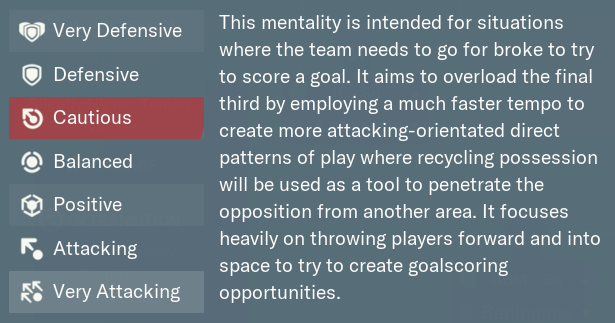 Also, tutoring (now mentoring) has completely changed in this year's FM, meaning signing (old) players with great personalities isn't enough in order to spread good personalities/traits across the team. Those players must have a way to significantly impact others. Previously (as stated in the OP), you could decide whether you wanted to pass on just the personality or personality and traits, now it is a bit unpredictable which I absolutely love. I'd move them into the First Team squad for cup games etc when they could get a game and then return them to the relevant squad afterwards. If they're used regularly then they'll be permanently in the squad. Finances are good. We're in a position not to be forced to lose players for financial reasons, which is important. Loans contribute at least a few million per month. You'll also notice that I negotiate deals in instalments as to spread the revenue across multiple seasons, which helps with Financial Fair Play. Loan deals were vital in securing such a price tag. We have players playing right at the top level in various leagues across Europe, ready to either return and break into the team or to be sold on if we need the revenue at zero cost to the club. Working on an additional midfield configuration. Florentino Luis has matured into a phenomenal player and I worry he's somewhat under-utilised in the Half-Back role, simply shielding the defence. I like the idea of moving him into the midfield strata into an all-action midfield role, using Dantas centrally and as the holding player. Solid start to the experiment. Edited March 24 by Ö-zil to the Arsenal! Need to think carefully about this one. Could be the largest change we've had since taking over..
Yea, I think I cannot justify turning this down. The problem is the debt, which at the moment I'm paying around £2.3M/month. I employ the same loan strategy, along with a few sales, but so far no profit at the end of the year. Maybe I'm too OCD. 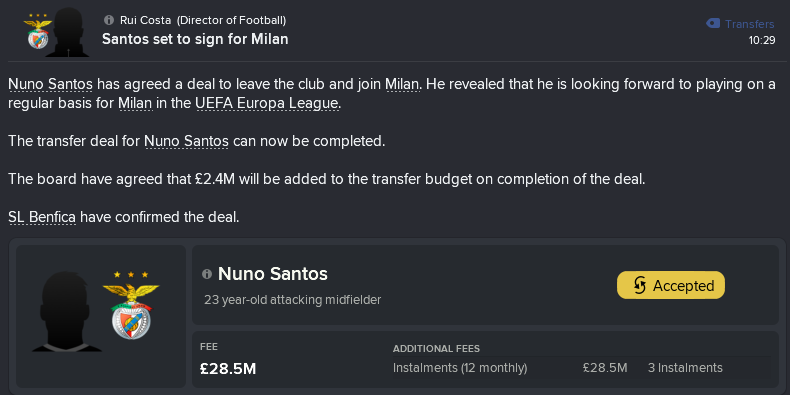 Do you have plans to start an FM19 save, or are you waiting for FM20? Not trying to steal the limelight from @Ö-zil to the Arsenal! 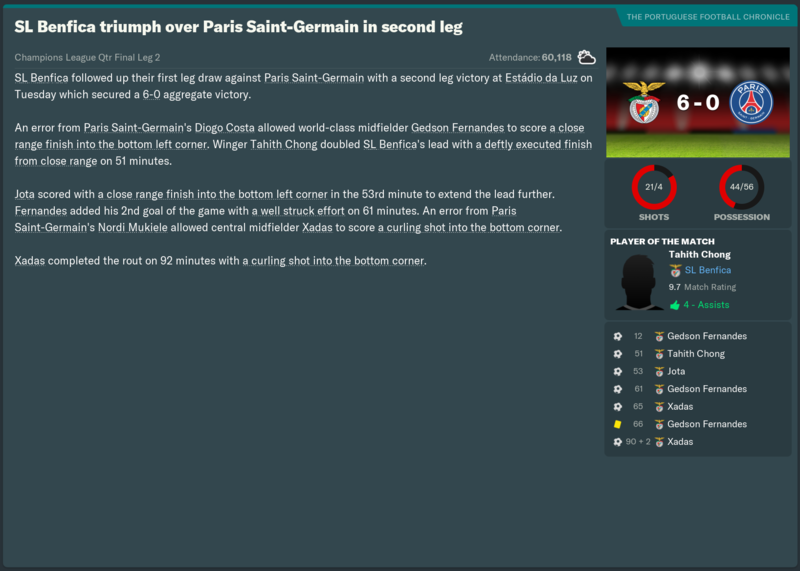 but I thought I'd post a nice home win against PSG. Bar Gedson and Ruben Dias, no one else in this team is world class, this team is certainly well drilled. Definitely can't turn that down. If Embalo's ready like you say, opportunity to bring him into the attack, and move Felix back into the midfield - Gives you the physicality you had with Fernandes up top, without losing sacrificing it in the middle? Hi guys. 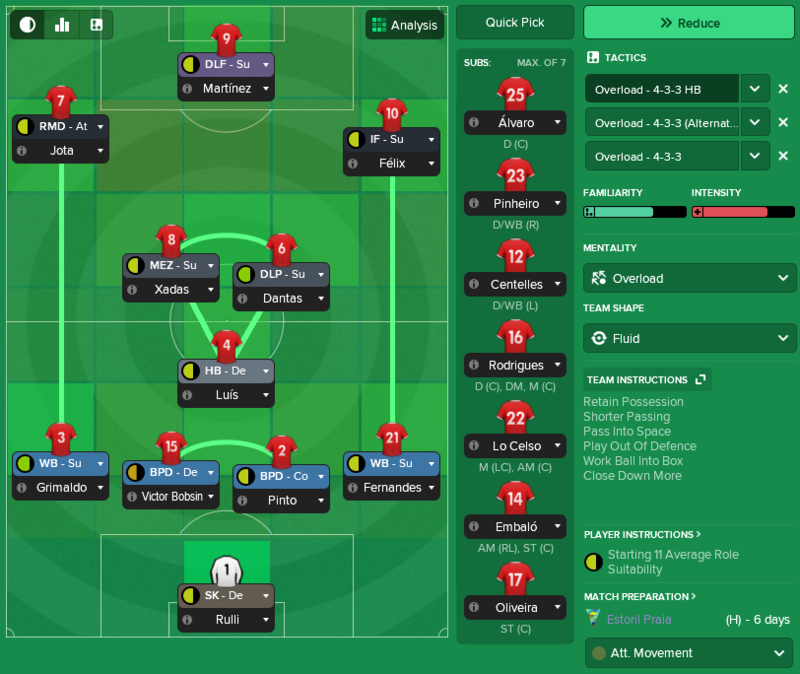 This is my take on my Benfica carrer I've just started. Medium to long term plans include owing the the spine of the Portuguese national team. I've certainly have the academy for it, best one in the game by far . Florentino Luis enjoyed the freedom of his new 8 role in midfield. Still letting it settle, but very happy so far. @Ö-zil to the Arsenal!do you have an issue with long shots?Can I see a screenshot of a match showing attempts at goal,i have too many longshots, I just wonder if it's due to the age of my 1st team?To young possibly, leading to attempts from distance, could that have an affect do you think? Is there anything in my set up to suggest wanting to hit longshots instead of trying a through ball? I actually seem to be just about the only person around here that doesn't mind the occasional long shot Looking at your set up I cannot see why you'd have a problem. I normally start using Work Ball Into Box when I hit team mentalities or above. Perhaps try looking at who's shooting and see if they have a trait or a PI making it happen? The other thing you can look at is the scenarios in which they are shooting, are they shooting when there's no other option, in which case can you mitigate that with your tactics? Xadas always loved a long shot for me, but they were pretty effective. At one point in the second season Xadas and Talisca had long shots thundering in from everywhere! Edited March 30 by Ö-zil to the Arsenal! I've moved Xadas over to the left and Felix to the right which favours their preferred foot, it has stopped congesting things outside the box and has opened up a bit more space. Much more space for through balls into the box.Xadas has shoots from distance so there will always be a few from outside the box. How's Joao Carvalho doing? Always had a soft spot for the guy as a classic playmaker but he's always been a few places behind the first team so ended up out on loan. 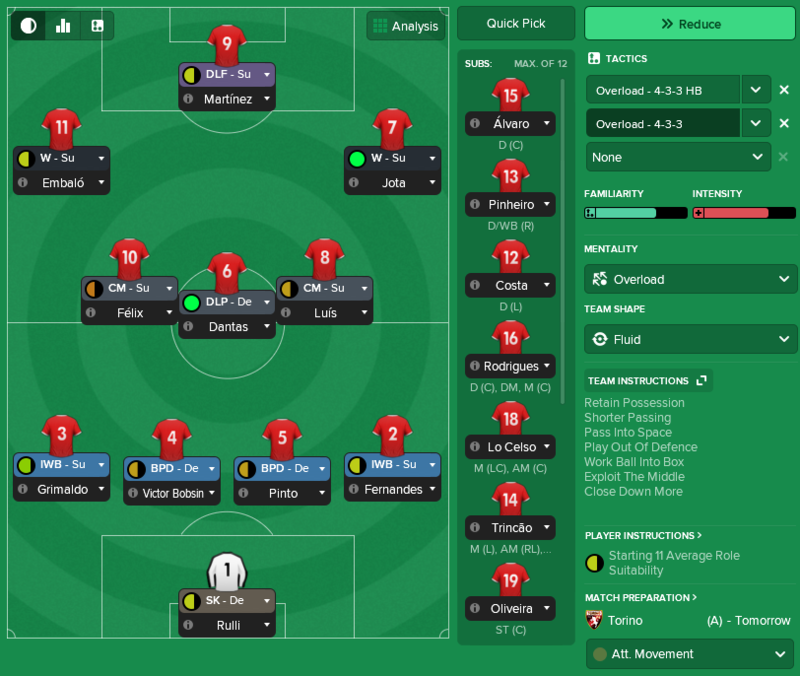 One of my observations on the Benfica save is that versatility means that you can set up in so many different ways, and it feels like a continual evolution depending on who's on form, who is developing well and how the opposition is reacting. 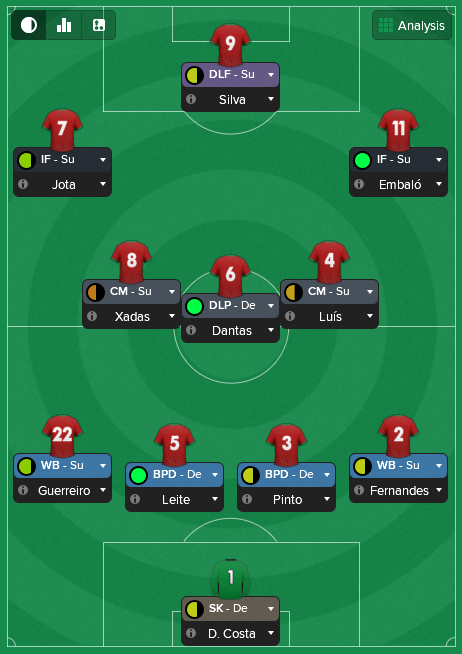 Off the top of my head.. both wingbacks can be classic wingbacks or inverted.. Dantas and Luis can interchange between MC and DM, both playing each role completely differently.. Fernandes can play right back, right-sided MC or right wing.. Jota and Embalo can play as wingers or inside forwards on either side.. Joao Felix can play the free role in midfield, or any role in the AM strata..
One question, actually - how are you finding the positioning of Florentino Luis at DM(S) in relation to Dantas at DLP(S)? 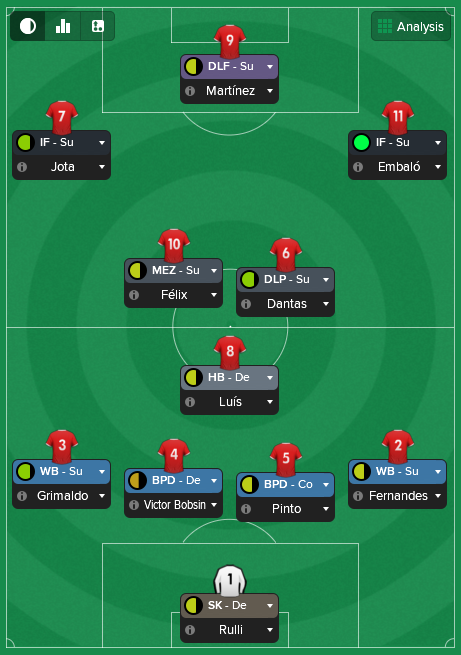 I've always liked the idea of using one of the more expansive DM roles - particularly Regista with a player like Dantas - but whenever I do it with 2 MCs ahead they end up right on top of each other in a cluster. Have you noticed an issue? Florentino Luis was excellent playing a more expansive role on the right of the flat midfield 3 and the combination of him, flanked by Gedson Fernandes gave us near complete control of the right side of the pitch. The issue, however, was that his presence was missed on the left side. As a tactic, it worked wonderfully and - annoyingly - I'd like to have used it if I still had Xadas as a more all-action left-sided MC. However, João Felix is a more classic playmaker, in the Iniesta mould. Whilst he's a wonderful two-footed, intelligent, creative, technical footballer, he lacks the strength, bravery, work rate for the all-action midfield role. It was clear from the first couple of games that the balance wasn't there. The pressing on the left was nowhere near as intense or effective as on the right and Felix was not dynamic enough, leaving space in front of the defence. Not necessarily a problem in the Portuguese league, but a big concern in Europe. One option was to switch the AMR/L back to wingers and play inverted wingbacks and free up the wide MCs to play a more attacking role, but that was then beyond the scope of how I wanted Florentino Luis to play. A brief experiment playing asymmetrically theoretically fitted both, but messed up the passing triangles. So, back to the more specialist midfield 3 we used last season, with Joao Felix dropping into midfield as a direct replacement for Xadas and Embalo adding pace, power, intelligence and technical ability, cutting inside from the right wing. Jota and João Felix are two of the top technical, attacking players in Europe at the moment so I'm excited to let them combine on that left flank. Both attribute profiles look a little bit more lightweight than some of the others but their two-footedness makes them very unpredictable in attack. ..and we could still see Luis advanced into an MC trio with Portugal where we'd still benefit from the balance of Xadas. Never let's me down but has to share DLP with Arthur. Luis has stays back at all times so doesn't really get in the way of the 2 MC's in front of him, he keeps up with play and always offers a passing option. for your youth development, do you take control of training for all your teams including the U18s? 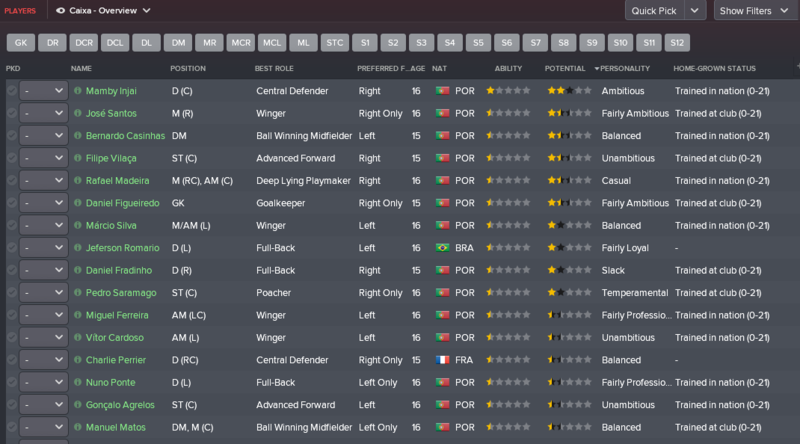 The U19's are developing rather nicely. I'm having an absolute blast playing this way, it's all about the youth development,minimal transfers unless they are A)Young and B)a tutor with the correct personality. @Ö-zil to the Arsenal! 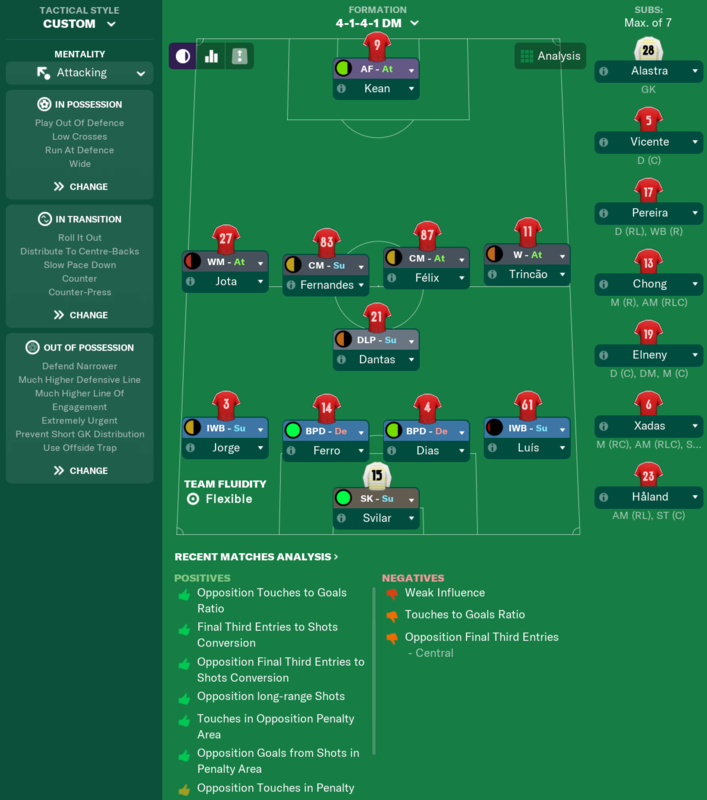 FM19 also has an U23 team with even more talented youngsters, I may have to run 2 saves across the two FM's FM19 could be a bit trickier to develop youngsters as you have mentoring units as opposed to individual mentors and these units consist of 3 or more players, on the flip side it could be even better at developing if I put a professional in with 4/5 lesser personalities and they can all become professional at the same time. Wow, some familiar names there but also quite a few new ones. Looks like in a couple of years the squad will be more competitive and versatile than ever. Dilu-Diop looks particularly useful as a two-footed defender, as does Alexio in midfield. Are they real players or newgens? Either way, you'll have some options. Looks like Dantas isn't quite so strong this time around, although could be the opinion of the report or just the luck of the save. Also Alves as a naturally right-sided attacker there, something my squad has also been missing. Edited March 31 by Ö-zil to the Arsenal! A little off topic but OH MY GOD, what the hell is this? I've never seen this before. Look at the freaking date! !What a bloody coincidence.